I've always been a huge fan of makeup, but it was only when I was in my mid-to-late teens I discovered more of the high-end makeup brands. 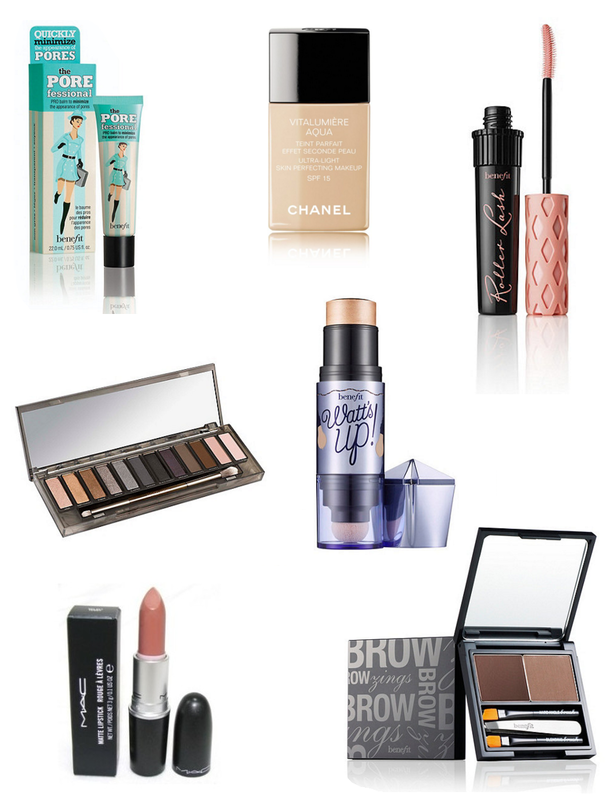 I love finding and purchasing new products to try out and building up my makeup collection. My current favourite and go-to brands are MAC, Benefit, Chanel and Urban Decay, although I would love to try products from Nars, Bobbi Brown, Charlotte Tilbury, just to name a few! I can't remember the last time I bought myself new makeup. A few of the items above I have purchased before, such as the Benefit The POREfessional primer, Chanel Vitalumiere Aqua foundation and Benefit Roller Lash mascara. I love the primer as it's really smooth on my skin and the foundation is so light, it looks really natural. I used to wear MAC Studio Fix foundation but I find it too thick and heavy for my skin. The Roller Lash mascara from Benefit is my current favourite mascara - it lifts, lengthens and curls my lashes and lasts all day too. I think this will be the third time I've repurchased it. I've wanted a new highlighter for ages and really liked the look of the Benefit watt's up! highlighter to give my face a healthy glow and to add definition. Before any purchase, I like to read reviews to see other people's opinions, and apparently it's really easy to apply and very flattering, so I can't wait to try it out. I've also had my eye on the Urban Decay Naked smoky eyeshadow palette since Christmas, so decided to treat myself, as I use my Naked 3 palette all the time. I ocasionally fill in my eyebrows with a brow pencil, but I loved the look of the Benefit Brow Zings Eyebrow kit and it comes with all the tools you need. Finally, there's MAC Velvet Teddy lipstick which looks gorgeous. MAC lipsticks are my favourite and I've heard that Velvet Teddy is a must-have! What are your makeup essentials? Have you used any of the products mentioned?